In April, 841 was ferried to England where it was assigned to the 61st Troop Carrier Squadron (TCS), training with and supporting the 82nd Airborne Division. 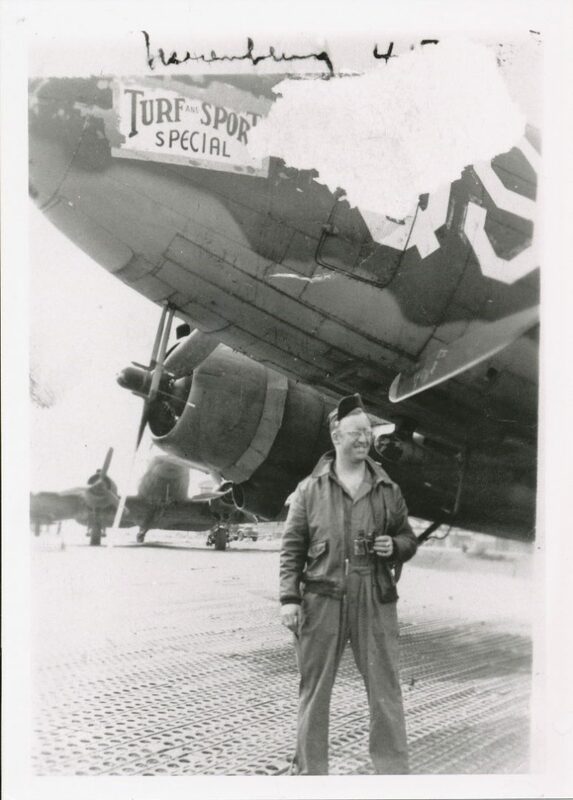 In the 61st TCS, Tech Sergeant “Bing” Wood, a long-time unit member and Aerial Engineer, became 841’s Crew Chief, responsible for all aspects of the aircraft’s maintenance on the ground, and operations in the air. A horseracing enthusiast, Bing named the aircraft after his favorite racing magazine, the Turf and Sport Digest, modifying the name and logo as the “Turf and Sport Special.” Turf went on to fly in combat operations in the European theater, and the patched shrapnel and projectile holes in its fuselage and wings bear witness to its battle record. At war’s end, Turf soldiered on in Europe, participating in the opening stages of the Berlin Airlift in 1948, and then flew for another decade before coming home. It was finally mustered out of active service in 1964, when it was transferred to the Army for use as a static load trainer. In 1986, it had reached the end of its useful life and was little more than a hulk, destined for scrap unless a museum was willing to take it on as a restoration project. A small group of aviation enthusiasts at Dover AFB asked for permission to acquire 841, and in October of that year it was airlifted by a CH-54 helicopter to Dover from Aberdeen Proving Grounds, and restoration to its WWII appearance and configuration began. 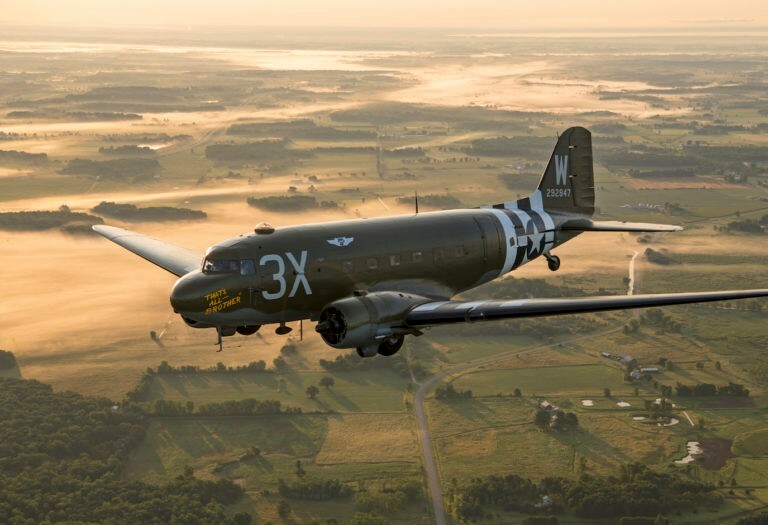 Today it is one of the most accurately restored examples of a wartime troop carrier in existence, allowing the Air Mobility Command Museum to tell the stories of the men who flew, maintained, and jumped from the aircraft. In May, Turf will be joined with another combat veteran, 42-92847, which came off the same production line two days after Turf; named “That’s All… Brother,” it went on to fly in the same combat operations, but with the distinction of being the first aircraft of the 800 aircraft armada that delivered more than 13,000 American paratroopers into occupied France on June 6, 1944. 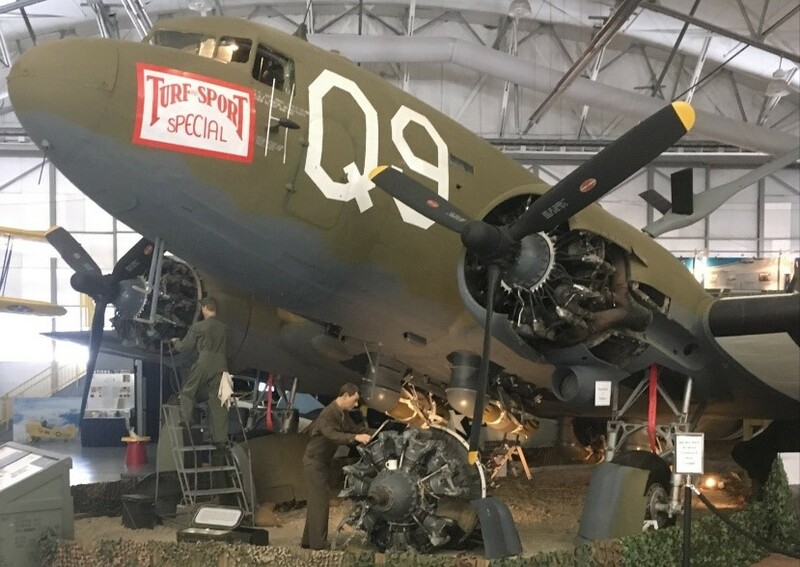 You’re invited to visit the AMC Museum on May 4th where you can see these “brothers in arms” as Dover AFB and the AMC Museum commemorate the forces that helped liberate France. Just in the interest of accuracy of details, it should be noted that of those 800 C-47s, two serials (#27 and #28), totaling just over 100 planes did not drop parachutists, but rather towed gliders with addition troops and supplies, vehicles, trailers, artillery, communications equipment, and even the medical team and a small Clarke bulldozer. Serial #27 of the 434th TCG flew from Aldermaston field to landing zone E in support of the 101st Airborne and Serial #28 of the 437th TCG flew from Ramsbury to landing zone O in support of the 82nd Airborne. 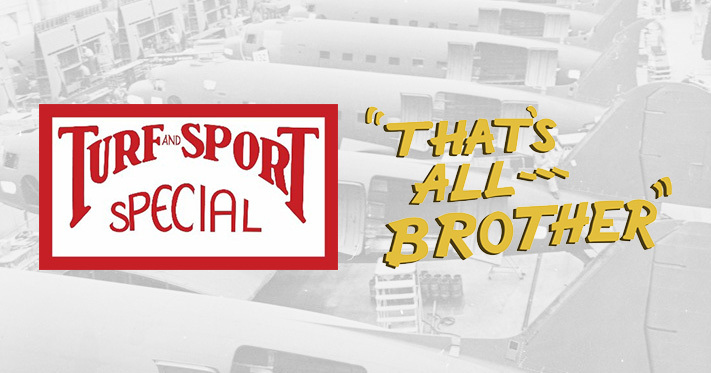 That’s All…Brother was preceded by the aircraft carrying the Pathfinders who would mark the drop zones for the 101st Airborne Division, but it was indeed the first aircraft of the 800 troop carriers that dropped two airborne divisions.